"He was certifiably insane, an Ayn Rander who fancied himself an Übermensch and “the Singularity’s chosen avatar,” but he was surprisingly good company if you kept him on topics like tennis and fishing." There was absolutely no reason to reread Cityboy. But I was a bit down on my luck after starting and failing to finish The High Mountains of Portugal by Yann Martel. Life of Pi is one of my all time favorite books (also by Martel), and even the movie is pretty spectacular, so my expectations were way too high. I bought the book on a trip to Portugal and imagined that it would be a breeze. Yet I was wrong, I found The High Mountains of Portugal so tedious that I decided to skip it for good. After a few hundred pages of vague, uneventful landscaping and exposition, I had no will to go on reading. What I really needed was something that I could pick up without the risk of boring myself to sleep. Cityboy is something I read when I started my studies and I figured it would be a good send off to the corporate life. It's supposed to be a fictional account of the excesses of the banking system, but the cover up is so transparent that it only takes a few tries on Google to figure out that "Scheissebank" is Commerzbank and "Banque Inutile" is Societe Generale. The fact that the main characters name is "Steve" is probably only there to deter lawsuits, such is the extent to which the storyline resembles the authors own life. For all I care, you can read it as an autobiography. "Steve's" job is to show the reader the extent to which the banking system (as it was before 2008) is corrupt, in-bred and pointless. Bankers make millions of pounds in bonuses just to screw their clients, use drugs and engage in other immoral behaviors. Steve is a utilities-analyst tasked with producing research notes on utilities firms: water, electricity and so on. Some of the material will be genuinely interesting to outsiders, because it's mostly about things that you would never read about otherwise. The banking sector has always espoused opacity, so there are a few precious sequences showcasing the average day in a bankers life that I found enlightening. Pick it up for the fun turns of phrase and stay for the juicy gossip. 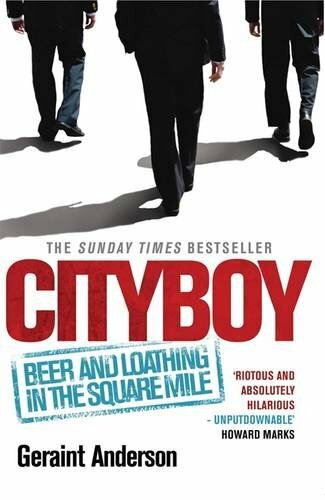 The biggest problem with Cityboy is that Anderson himself isn't very likeable, and ultimately seems shallow and moronic. He can pretend to be a left-wing hippie all he want, but actions speak louder than words. Especially at the end, when he ponders the ludicrous amounts of money that he made by hustling clients (but mostly staying on the right side of the law). He promises to give part of the proceeds to charity, but to me that sounds like bull. Talking about giving to charity isn't the same thing as actually doing it. Anderson even tries to create an antagonist in "Hugo", a stuck-up fool of a banker, who somehow manages to get the most votes in industry surveys. But you can't really have an antagonist when there is no one to root for anyway.